Mix all ingerdients with water to the consistency of dosa batter. Make thin dosas. Serve hot with chutney powder. I really enjoyed goin’ thru ur recipes. I’m from gowda saraswath Brahmin thoroughly bred in Mangalore and enjoy cooking various cuisines as much as i enjoy eating!! The best compliment i have recd is from my hubby who says that i cook better than his mom n’ my MIl happily agrees to it. Don’t really know if its true ! I believe the main ingredient to any recipe is one needs to put their heart in what they cook…n’ its definite to taste gr8!! Shelly, the batter should be very thin like watery. You should just “throw” the batter on the hot tava, it can not be spread like urad dosas. This is an instant dosa, nofermentation required. I made this dosa for breakfast today.. liked it!! SO did my hubby..thank u. I did not add sooji though.. Planning to add it next time.. should i put in soojistraight from the packet or should i roast it? ?please answer..
Shilpa: Maithri, sooji is directly added. No roasting required. I tried it today and they turned out really YUMMMMMMYY with the ginger chutney from your site. Tried a little variation. Stuffed with chopped tommato and chedder cheese after they were done and made it into a wrap. i am writing from Fiji Island. I hope u now where fiji is on the world map. i would like to try most of this pure indian recipies. I love cooking in weekened when i am at home. this way i also learn so many traditional cooking. i also love to make friends through yr web my email address is pratinam@govnet.gov.fj. iam married with two children. my age is 40. l would like make friendship at least i will be able to now more about india. Can you tell me some receipres for 19 months old baby. I just now I tried rice dosa.We also call it ghavney in marathi.I just liked it so much.I will prepare again. specially the consistency of the Atta used? Shilpa: Puja, the batter is almost like water. Since you do not spread it with ladle after pouring on tava, it is better to make it very thin. Thanks a TON! for all this information. The breakfast receipes are very useful and interesting also. I really appreciate your initiation of creating this website. All the recipes are very nice. Will again write to u after i try out few receipes. Hi, I tried this out today for the first time, however i added some grated coconut to it too along with cut green chilles. The dosa didnt crsip up instead it craked all over even before I could turn it (it had small visible cracks all over and when I trid turning, it just split into small pieces. I did try to make a thin enough batter. What could I be doing wrong, is it to dry coconut flakes? I have never made dosa’s at home before and i wanted to start with an easy instant one like yours. Thanks. hey Shilpa, you can mix this bosa batter in curd..
tried this recipe came out real good….. I treid this recipe but it did not turn out well.I made the batter of the consistency of neer dosa and it got stuck to the tava..not sure what went wrong….. I would love it, if you could provide the recipe on how to make true/authentic GOWDA STYLE – NON VEGETERIAN Recipes. I have been hunting the net for the same. I would like to get recipes of how to make Doanne Biryani, Boti (intestines) fry and curry, gowda style chicken and mutton curry (thick curry; both the green and red color; that can be relished with ragi ball), mutton chops and mutton fry. Can u make dosas with Iddiappam Flour? I have tons of iddiappam flour and I don’t enjoy the iddiappam making process so I want to use it for other stuff. Do u have any ideas. Thanks Shilpaji for replying for instant dosa yes this is very nice and tasty will try. 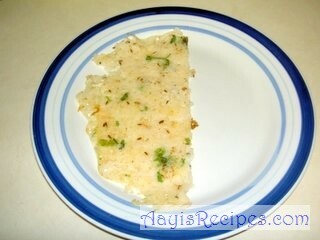 hey shilpa i tried the rice flour dosa and it came out very very well……my hubby liked it a lottt…….. I have made this dosa so many times. Really liked the recipe. Thanks. Will be blogging about it soon. i made this rice dosa for dinner, it came out well! thanks a lot. love ur recipes. I am new to this blogsite and I wanted to tell u that i tried the above recipe and it turned out wow!! Can you please xplain what you mean by ‘dosa batter consistency’? I’m making dosas for the first time. My mom said it’s okay to use ragi flour instead of rice flour. So when I made the preparation the dosa batter itself made boiling motions. And then it got burnt. I thought it was too thing so I added a little more flour, but it still wasn’t roasting to the extent to which I could take it off of the tava – it was directly getting burnt. I think my proportion is wrong – can you help me out?